As 2011 draws to an end, this is a good time to reflect on some of Applied Ethics’ accomplishments during the year. Shogofa at the airport about to return to Afghanistan. Also pictured, Robert McNulty and Nora (left) & Joanie McNulty. We are very proud of Shogofa, the Afghan student brought to study in the US by Applied Ethics/Pax Populi, who has just completed her third semester at Salem State University. For family reasons, at the end of the autumn 2011 semester, Shogofa returned to Afghanistan where she expects to stay for the next few months. 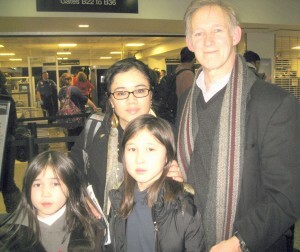 We hope to see her back in the US to continue her studies before the arrival of summer. In 2011, we worked very hard to develop the Pax Populi Tutoring Services. During the autumn semester we had about 20 teachers working with a similar number of students. Under the leadership of Jeff Jorge, who was ably assisted by Stefan Winata, we made considerable advances in curriculum development and procedures, including the creation of an orientation document that allowed us to introduce the program to new participants with a better shared understanding of the program philosophy, objectives, policies and procedures. In July, Robert McNulty, the head of Applied Ethics/Pax Populi traveled to Afghanistan. There he had an outstanding visit to the province of Bamiyan, where he met with various educational and civic leaders. Following this, we began to extend our Pax Populi program to that province. It has been a gradual expansion, starting with only one student from that region, but we are off to a very good start and hope to include other participants after Afghanistan’s long winter school break comes to an end. 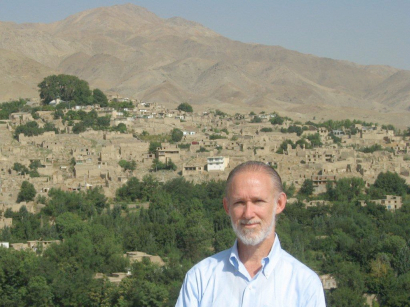 So as to share with others insights from this recent trip to Afghanistan, in November, Robert gave a talk to the Bentley University community, entitled, “The Other Afghanistan.” The talk focused especially on the conditions of the Hazara ethnic minority and the province of Bamiyan generally. One sad setback during the year was that despite working for several months to get everything arranged to bring the Afghan student, Hila, to study at Marblehead High School, the embassy did not provide a visa and ultimately, the plan did not come to fruition. Pax Populi’s work also extended to places other than Afghanistan. As a result of the 2010 initiative through which two Israeli and two Palestinian professors were brought to the United States to discuss ways of advancing peace between their two peoples, in November 2011 Dr. McNulty was invited to participate in a conference on the future of the Palestinian economy held at Hebron University in the West Bank. This gave him a firsthand view of the conditions of both the Israeli and Palestinian peoples and the obstacles to arriving at a successful peace settlement. After returning back to the US, Robert was one of a five-person panel at a public forum held in Marblehead, Massachusetts on the prolonged Israeli-Palestinian conflict. In December, McNulty also traveled to Lahore, Pakistan, to deliver a talk on the role of ethical business in advancing peace. This talk was particularly significant given Pakistan’s involvement in the conflict in Afghanistan, but also because of the global threat posed by the conflict between Pakistan and India. •	In April, Applied Ethics awarded the first Pax Populi Peacemaker Award to the founder of SOLA, Mr. Ted Achilles. This took place during a major event in which the featured speakers were New York Times journalist David Rohde and Robert McNulty of Applied Ethics/Pax Populi. We are grateful to all the many people who gave of their time, intelligence, heart and soul to Pax Populi initiatives to help advance the cause of peace in Afghanistan and elsewhere.